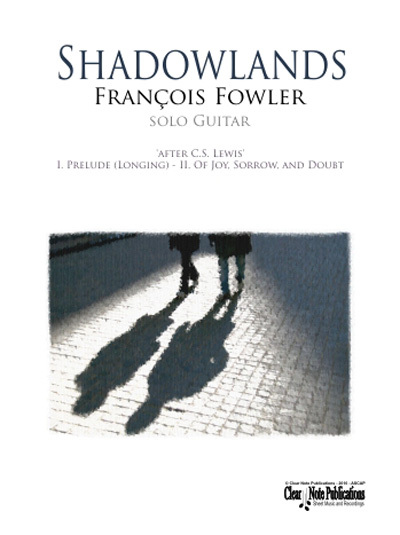 Shadowlands, a composition in two movements for solo guitar, was inspired by British novelist C.S. Lewis's memoir Surprised by Joy. The title of the piece comes from a movie about the novelist's life called Shadowlands. The slow and pensive first movement introduces the main motive of the work and concludes with a falling melodic passage made up of fragments of the main motive over a harmonic progression by major thirds. The second movement begins quietly and alternates between contrasting sections that are mysterious, melodic, passionate, and fiery. Guitar techniques and effects such as harmonics, rapid arpeggios, and rasgueados are found throughout the second movement, while all along developing the main melodic motive presented in the first movement. A short quote from Brahms's first symphony, marked Religioso, brings the piece to an ending shaded in doubt.